We took 12 Cubs and eight assorted Leaders to this weekend camp and a wonderful time was had by all. 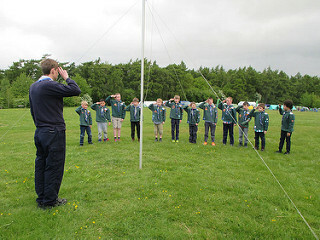 The Scout Leaders, helped by some of the Cub Leaders, had set up the camp on the Thursday evening so the Cubs were able to arrive on the Friday evening and settle themselves straight into their Patrol tents, where they would be sleeping four to a tent. Flag Break was held at 19.45 to officially open the camp followed by a Wide game where the Cubs, in teams, had to search for gold nuggets across the campsite. This kept the Cubs busy for an hour or so and, after so much running around, also tired them out so they were more than ready for supper and bed. Saturday morning, after tucking into a good breakfast, saw the Cubs more than ready to face the day’s activities. In small teams, armed with individual cards showing what all the activities on offer were with each activity being signed off once completed, the idea was that the Cubs tried to complete all the activities by the end of the day. There was a wide range of activities including making Indian head dresses, Sheriff Badges and Totem Poles as well as taking part in Cowboy Boot throwing, Horseshoes, feeding the Cattle, Backwoods cooking and Tracking. The Archery and Shooting ranges were also open for any of the Cubs who wanted to have a go. To fit in with the Wild West theme, the Cubs all wore checked shirts and Cowboy hats so really looked the part as they worked their way around the activities, breaking off only for lunch or drinks. Needless to say, the Cubs were exhausted by tea time but tea followed by Tuck Shop seemed to revive them so they were all on good form for the traditional Camp Fire singing and sketches later that evening. Supper and bed followed with all the Cubs fast asleep virtually within minutes of getting into their sleeping bags! Sunday, like Saturday, was another warm sunny day with the morning spent watching a very enjoyable and interesting Wild West show put on by an enactment group called ‘The Lawmen’. Dressed in authentic costumes, both Cowboys and Indians, the various members of the group told stories or acted out scenes depicting events from the Wild West days. The brawling, shootouts and anything with explosives seemed to be the favourites with the Cubs! Before too long, with lunch over, it was time to break camp, get everything ready to be loaded on to the van for transport back to HQ, join in with Flag Down and official closing ceremony then hand 12 very tired Cubs back to their parents. At this point, the Leaders all took a huge sigh of relief, glad that another successful camp had been enjoyed by all.